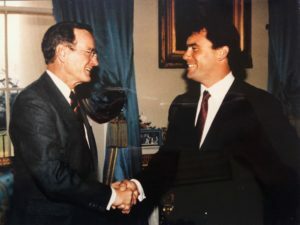 Riki Ellison meeting President George H. W. Bush at the White House during his Presidency. A special man and special leader at a critical time and a very special time in our lives. My memories of George H.W. 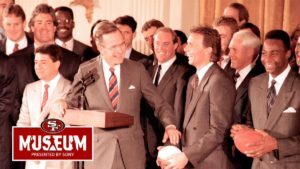 Bush are Super Sweet as we gathered as Super Bowl Champions at his invite to the White House on February 4th, 1989, just after beating the Cincinnati Bengals a week earlier on an epic fourth quarter comeback led by Joe Montana. The President was a great missile defense supporter and was taken and surprised when I asked him in person that day on our nation’s missile defense capability to defend our nation. He was graceful in his answer, as he quietly led our missile defense growth with the continued development of the Ground Based Interceptor (GBI) predecessor, the Exoatmospheric Reentry Interceptor Subsystem (ERIS), and our Memorandum of Understanding (MOUs) in missile defense with Israel and Japan. President George H. W. Bush was also a proponent of Brilliant Pebbles, a concept for a space-based missile defense interceptor layer, and the Global Protection Against Limited Strikes (GPALS) that did not come to fruition. We had a follow-on meeting later during his Presidency and continued our discussion on the nation’s need for missile defense as I was working on the ERIS program during my off seasons. President Ronald Reagan was a challenging act to follow and there was only one that could and did do it with grace and dignity.